Giveaway time! Just for kicks! This giveaway is generously sponsored by Verve 360 Pittsburgh salons. The prize is two gorgeous Zoya colors from their Designer collection: Natty and Toni. Please leave a comment in the comments of this post. Let me know why you're loving Nailed It or why you're into Zoya polish. Please also include your email address using the Rafflecopter widget below. Sorry, but this giveaway is only open to residents of the contiguous US. I'll choose a winner at random. All comments need to be submitted by November 20 at 12:01 am EST. Thank you again to Verve 360! I'm loving your blog because it has a lot of nail art/polish that I hadn't seen in too many other blogs I frequent. I also think the pictures are top notch (very crisp and clear, and the blog overall has a very fun and easy vibe about it. I fell in love with zoya because of the release of Yara and Neeka, and now the gloss collection which I LOVE. Too bad it chips on me all the time, I've yet to find the magic combination to make it stay on my nails! I love Nailed it because you always have beautiful manicures and swatches. And these Zoya polishes are really pretty. I love Nailed it because all of the amazing designs are so inspirational in my own art. Try entering your email again. It should be better. I love your blog because you have simple but awesome designs, and you're super helpful and kind to your readers :) I haven't tried Zoya yet but I would love to! I think your blog is absolutely gorgeus. All those nail arts inspire me when I have to make my nails. I just wanted to double-check with you that you are currently living in the US. This contest is only open to those living in the contiguous US. I love your blog because you always have fun contests and amazing and unique nail designs (that are achievable for beginners!). Personally, I have never tried Zoya, as it is not sold where I live, but I have always wanted to try! I love your blog because you post every day, have super cool designs, awesome contests, and its just super fun to read every day! I have never tried Zoya, I've never heard of it either! So I'd love to try it! Your blog is awesome, love the Diamond tutorial. I must try this! my emails is isgood at rocketmail dot com , I couldn't put it in Rafflecopter. Try submitting your email to the Rafflecopter now. I've made a change that should help. I love your blog because you have inspiring, not daunting, nail art! I love Zoya because of the great formula and pretty color options. I'm not sure what problems people are having. Some people seem to be submitting things just fine. I have changed the widget though now. Please let me know if you're still having trouble. I like your blog because the designs are awesome but very 'doable.' Plus you don't rely just on glitter combos. I love glitter and all, but sometimes you just want a nice creme. I love these colors from Zoya because I am very into the 'vampy' colors right now. I love Nailed It because of the clean manicures and adorable designs! I can never get my nails to look as clean as yours - please teach us your tricks! Check out my manicure tips page! It's all there! When I found your blog I spent what felt like hours going back through all of your posts because I love all of your nail art. Your nails are always so perfect looking and you have given me some great ideas! i recently bought 4 zoya polishes and i am in love! the consistency is perfect which makes application super smooth. plus their color selection is amazing! I love your blog you do nail art quite a bit and it is always something new or different. I love your blog for the nail art, the great pictures, and the beautiful swatches. :) Thanks! I love your manicure cos it always looks very professionally done and also the nail art is always very unique and a real source of inspiration. I love Zoya because of their huge selection of colors and the quality they consistently create is amazing. Love it. I love the inspiration I get when I look at your nail art--I'm really kicking myself for not attempting the two bottle challenge. And Zoya is always coming out with great collections I can't seem to live without. That whole "Ornate" collection is just calling to me. Zoya is amazing. Really. The bottles are gorgeous and ALL of the colors look professional. I love your blog, truly. I read it religiously, and I am always inspired by your nails! My dad thinks I'm nuts because of how much time I put into making my nails PERFECT! Also, I've never entered one of your giveaways, but this one is Zoya we're talking about! Why do I love Nailed it? So many reasons. From the catchy name of the blog to the detailed tutorials and constant inspiration, I have become an avid reader. I will be starting cosmetology school soon and I know Nailed It! has been a big part of helping me decide to becoming a nail technician! Mom says for as long as I spend on my nails I might as well get paid for it. 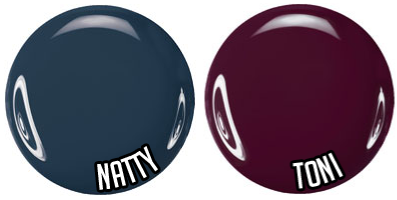 I have been wanting to add Zoya for months now and can't wait to get my hands on these colors by hook or by crook. I love your fun designs and original ideas. I also like your nails and beautifully applied nail polish! Zoya has some of the most beautiful colors and their bottles are super pretty! I love your blog because the nail art is amazing, yet still realistic so the average person could think about trying it out. I love Zoya because they offer such great promos and their Share the Love points make it affordable for me to buy their polish. I only started buying Zoya earlier this year and have built a nice collection all thanks to their promos. Zoya was the first brand I bought into. They have the best formulas, beautiful colors and excellent customer service! I am loving your blog because your blog name is super clever and awesome and I'm totally jelly :-P and because your photos are always high quality as well as your unique designs. Thanks for the giveaway! I love your blog because it's in a nail language I understand:) Your tutorials are some of the best I've read, your ideas are inspiring, and I always find a product I want to try when I come here. Also, Zoya is one of my favorite brands. Their colors (and color names) are awesome and their website is super user-friendly. I'm in love with the two colors in this giveaway! Thanks! I think your blog is great and I love your manis. Zoya is one of the best formulas ever. I love it! Sorry I live in the UK. Only just seen the open to US only bit. Love your blog and your beautiful mani's. Both Zoya colours are to die for! I am relatively new to the world of nail polish and manicures, so your blog as been a wonderful resource and inspiration to me. Your "How To Give Yourself a Manicure" post has helped me keep my nails from looking like a toddler painted them, and your tutorials have shown me that creating an awesome manicure doesn't have to be complicated or difficult! I have heard loads of good things about Zoya polishes, but I haven't had the opportunity to try them yet. Natty and Toni both look gorgeous, and I would love to have them for my collection. Thank you for hosting such a neat giveaway! I like your blog because I love your nails, and I love Zoya because of the application. I discovered you first on Instagram, and then was lead to your blog! I was drawn to your designs because they are simple yet executed so cleanly. There are so many of your designs I have yet to try, like your beautiful gingham and other striping/blocking manicures. Plus you have the most perfectly manicured fingers -- FLAWLESS! I really admire your work and hope one day to be as clean drawn on nails as you! I love your blog because your nail art ranges from beautifully simple to gorgeously intricate. That and you're just an awesome person. I love Zoya because their formula is wonderful and their colors are just so gorgeous. I find your nail art inspiring! You got me hooked on Sation polishes, too :) I love Zoya's formula and they wear really well on me. I love your blog for all the lovely nail art! And I love zoya because its 5 free. My 4 year old loves doing nails with me and I feel much better letting her have manis with mommy when they have less bad chemicals. I love how creative you get. Your nails inspire me! Zoya is just such awesome quality while still keeping it 5 free, and all at a reasonable price! Oh how do I love thee Nailed It blog? Let me count the ways..:) Love the terrific pics and amazing nail art! This is one of the best places to go when Im in serious need of inspiration! Also...I am an idiot and pushed enter before adding my GFC name...its Kmeyers101. Just came across your blog and I am totally loving it! Your manis are gorgeous and I'm discovering a lot of polishes to add to my wishlist. I love Zoya's formula and I absolutely friggin love your creativity! You have some of the best nail designs on the internet hands down! I dont own any Zoya nail polish, hopefully someday. But, I do enjoy visiting this weblog because you always have something different to show your visitors & you always have fun giveaways & contests. Love Zoya polishes. They all go on like a dream. I don't have these two though. Thanks for the chance. I love your blog because of the really nicely done nail art, and I'd love to try Zoya polishes because I hear they're terrific and I don't own any yet! i'm loving nailed it! i love doing unique things with my nails. it's like wearable art! you guys have given me so many new things to try. I love nailed it!! So much creativity here! Hello - just saw this post. Happy to hear about Zoya in the Pittsburgh, PA market!